Cadence is the number of strides you take per minute when you run, and since it's an easy metric to wrap your head around, it may be something you want to focus on for improvement. In a separate post we covered the basics of running cadence and what to look for when you analyze your data. In this post we look at methods for increasing your cadence, should you choose to do so. The subject of training to alter your running form has opposing schools of thought. Some believe that trying to change your natural gait is unproductive and can lead to injury. Others have taken action to modify their cadence and experienced improvements in performance, without the downsides. We're not jumping into the debate here, but you should be aware it exists. It's the same story with all training metrics: you want the most accurate data you can get. It's possible to measure your cadence manually by counting how many times a single foot hits the ground in 30 seconds and multiplying that number by 4, but this can be a distracting mental burden. It's a task better handled by tech. Most running watches provide automatic cadence tracking these days, and their accuracy is good, but there are external sensors you can use that outperform them. The most accurate cadence device currently is the Stryd footpod, and it's compatible with a wide variety of running watches from various brands. The big downside is that it's expensive, but in addition to cadence Stryd also supplies running power data and other metrics. If you use a Garmin watch, the Garmin Foot Pod and the Running Dynamics Pod (which clips to your waist) are both good options and they're more affordable. If you use a Polar watch, the Polar Stride Sensor is available, and another popular low-price cadence tracking option is the Milestone Pod. The first thing to do is to determine your current baseline cadence. An easy way to do this is to visit your SportTracks Workouts page and add the "Avg cadence" metric (if it isn't already displayed). To add it, just click the gear icon in the top right corner and select it. Next, filter the page by sport (Running), and look at your recent runs. There will be some variability, but you should be able to get a good idea of what your average cadence is. As you train to improve, it's best to target a cadence that's only 5% higher than your baseline. So if your average is 160, target a cadence of 168 for training purposes. Do this for as long as necessary until 168 feels normal, and then train for a cadence 5% higher than that. Keep in mind that if you get into the 180 - 190 range, you are in the higher end of the spectrum, and training to go even higher will likely provide diminishing returns. The metronomes that are used in music can be put to use in running, and if you own a smartphone (which you most certainly do), there are plenty of free metronome apps that will work for cadence training. An obvious downside is that you need to run with your phone (or another digital metronome device). As far as what apps to use, I tried out Guitar Tuna and liked it. PRO TIP: Adjust the time of the metronome to 1/4 beat. Get started by running a 10-minute warmup at an easy zone-2 pace. Next, start your metronome and have it set to 5 steps faster than your average cadence. It can be beneficial to run in place at first with the higher cadence, to get yourself adjusted to the task of timing footstrikes with the beat. When you run at the higher cadence — you should not increase your pace. Maintaining pace while increasing cadence will give you a shorter stride length, which is what you want. After a minute of running at the higher cadence, up the rate of your metronome to 8 steps faster than average and run for another minute. Switch between these cadences 3 or 4 more times and then have a 10 minute cool-down. If you like to run while listening to music, you should consider trying to increase your cadence by listening to uptempo tracks at specific BPMs (beats per minute). If you're a Spotify user, you can access a variety of playlists that are grouped by BPM. From the main screen of the Spotify mobile app, tap the Search icon at the bottom. On the Search page, scroll down the list of genres and tap on "Workout." There you will find a group of playlists categorized under "Running," and the name of each playlist will include the BPM range of the music. When you first get started, be sure to warmup first and cool-down after, and don't try to up your cadence over 5% of your current average, even if the more difficult playlists look more tempting. If you use a Garmin watch, a great way to train to increase your cadence is to create custom multi-step workouts that target specific cadence ranges. It's easy to make these workouts with SportTracks and export them to your Garmin watch. 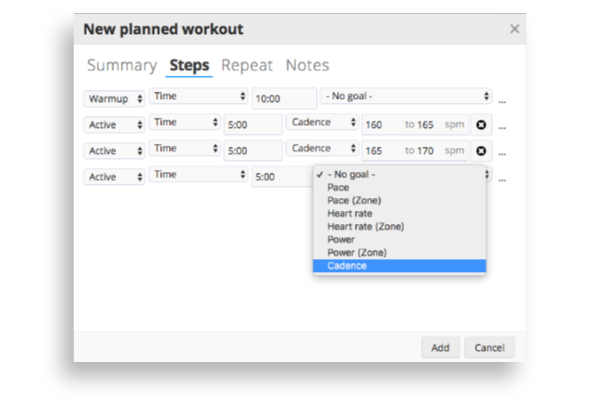 You can learn how to create these workouts in our Garmin Custom Workouts post. Start with a warmup and then create "Active" steps with cadence ranges. When you do the workout, the screen of your watch will display your average pace for the step, the amount of time remaining in the current step, your current cadence, and the range you specified for that step (along with all of your normal data screens). This is the exact information you need to improve. After you create a custom multi-step workout in SportTracks you can transfer it to you watch by connecting your USB charging cable to your computer. You can also send custom workouts from SportTracks to your Garmin watch wirelessly using this solution from Genius Wrist. Thanks for the nice Blog! But I think you mixed some things up: Running cadence is never calculated using GPS data (maybe you had pace in your mind for a moment...). Cadence is measured by small movement sensors inside your watch or your foot-pod, and it is usually very accurate, even in a sub -50-EUR watch.